Highly chromed tank and box. 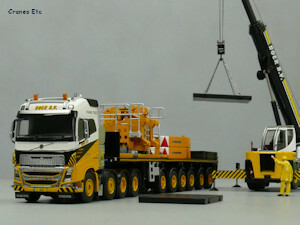 Taxi crane preparing for the arrival of a big crane. 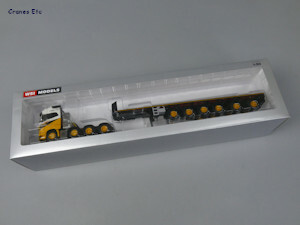 The model comes in a standard WSI branded box. Inside, the model sits in an expanded polystyrene tray with a clear plastic former and lid. 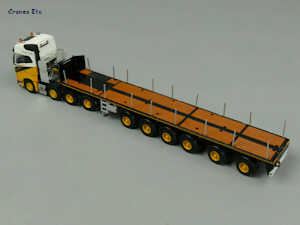 The only assembly required is to join the tractor and trailer together, and to fit the optional deck posts. 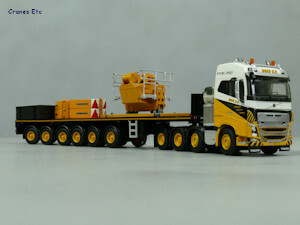 The Volvo is high quality, with very good transmission and suspension features on the chassis. 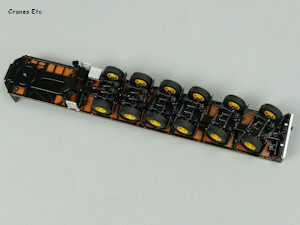 The tyres are different on the steering and driven axles, and the wheels are detailed. 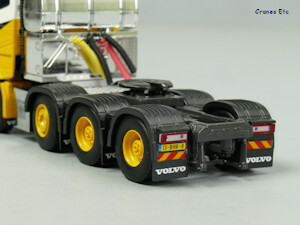 The Volvo front grille looks really good with its fine mesh, and the lights and Volvo mud flaps look realistic. On the roof there are horns, beacon lights and stub aerials. 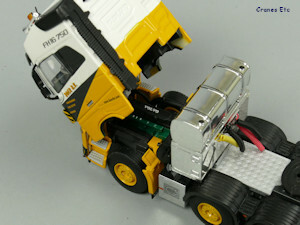 Inside the cab, the detail level is good. 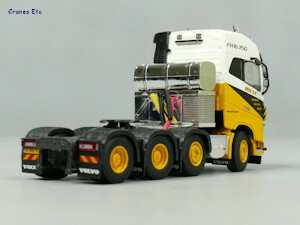 Under the cab is a detailed engine bearing the Volvo name. Behind the cab there is a chrome tank and box, and coiled lines and a diamond plated walkway. At the front and back there are number plates. The trailer has a detailed chassis and there are tanks and a spare wheel, although the underside of the replica timbers is plain. The side bars are plastic. The wheels and tyres are smart. 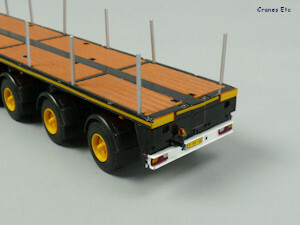 The trailer deck has plastic replica timber inserts. Along the sides of the deck there are yellow stripes. At the rear there are nice lights and a number plate. 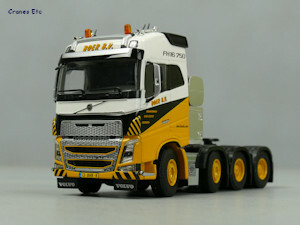 The Volvo has linked steering but with very limited movement. 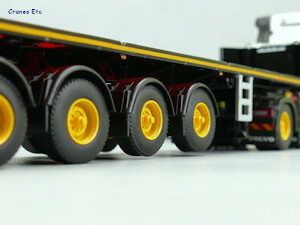 It has a fully tilting cab which poses tilted. 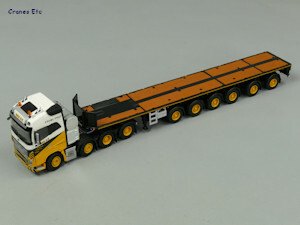 The six axle trailer has very good linked and proportional steering on axles 3 to 6. 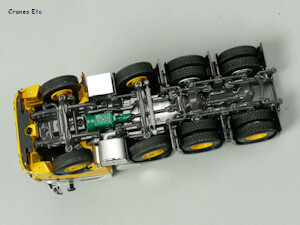 Axles 1 and 2 can be raised out of service. Landing legs can be screwed down. This is a high quality model with a high metal content and careful use of plastic. 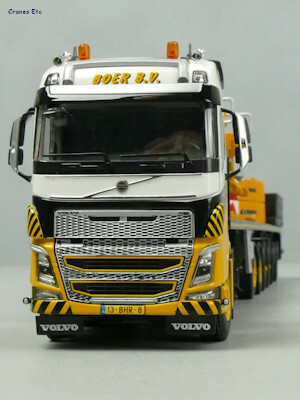 This is another very nice limited edition model, and it looks very good with associated models. 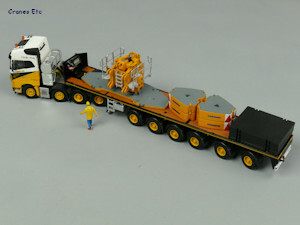 This model appeared in February 2018. Volvo grille is really good. Axles 1 and 2 raised out of service. 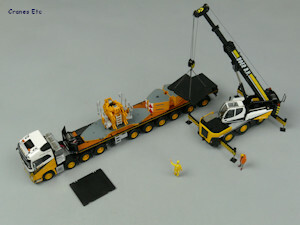 The loads are from a Liebherr LTM 1350 accessory kit.